One of my son’s school friends made him this sweet heart-shaped flamingo Valentine. It’s fun to bend the legs and neck and “pose” the flamingo! 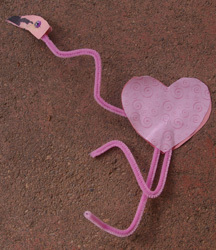 What You Need: Pink pipe cleaners; pink cardstock or construction paper; pink patterned paper (optional); heart shaped template or punch (or freehand or trace a heart); black marker; googly eye; glue. How to Make It: Cut out two hearts that are the same size. Bend pipe cleaner as shown to make neck and legs (for a large flamingo, you may need two pipe cleaners; for a small one you’ll want to cut one apart). Glue two hearts together, securing the pipe cleaners in the process. 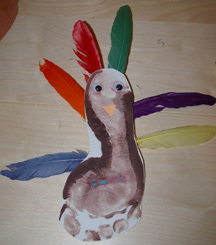 Cut two head shapes (an adult may want to make a template for the kids). Use black marker to make bill. Glue on googly eye(s). Glue head pieces together at the end of the neck. Bend pipe cleaners to position head and legs. 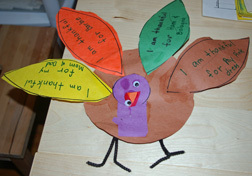 Child can write name or Valentine message on one side of the flamingo. 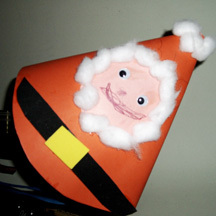 Let preschoolers suit up their own smiling Santa Claus with this easy Christmas craft made with supplies you probably already have on hand. He can even top the Christmas tree! What You Need: 8 1/2″ square red construction paper; approx. 2 1/2″ circle from pink construction paper; 1″ strip black cardstock; 1″ wide yellow rectangle (pre-cut or let children cut with safety scissors); 2 googly eyes; pink or red crayon; cotton balls; staples or tape; glue. How to Make It: Adult helps child twist red cardstock into a cone shape and secure with staples or tape. Then child uses crayon to draw nose and mouth on pink construction paper. Glue on eyes. Child then uses glue to adhere Santa’s belt, cotton ball beard and cap tassel. 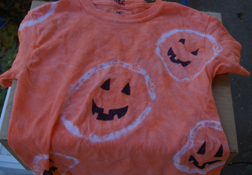 My son tie-dyed this cool Halloween shirt at drop-in day care, and I finished it off by adding the jack-o-lantern faces to the round “pumpkins.” It’s definitely a team project! What You Need: White T-shirt in your child’s size; orange fabric dye; rubber bands; black permanent marker (such as Sharpie).